(A)utomatic – This will configure your machine to automatically scan, download, install and reboot after applying any updates. (D)ownloadOnly – This will automatically scan, download and notify the admin if updates need to be installed. 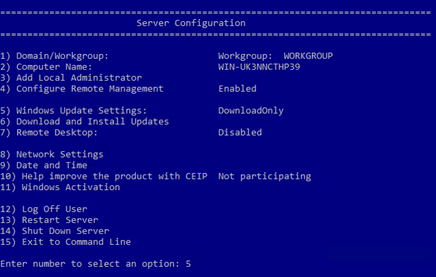 This is the default setting on Windows Server 2016. (M)anual — This turns Automatic Updates off. Your system will never check for updates. Press the letter specified in the “( )” and press Enter to apply. When the tool applies the configuration you have selected, you will see a message pop-up similar to the one below. Click the OK button to dismiss the message. The tool will refresh the menu and option 5 will now show the new configuration.